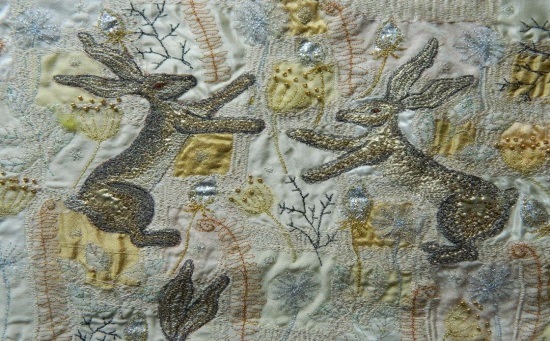 Rachel Hewitt will be teaching a free motion embroidery class in the Salisbury shop in March. You will produce a beautiful piece of art on the sewing machine using free machine techniques, building texture and colour by layering fabrics, using sequins and beads to make each piece individual to you. This class isn’t aimed at complete beginners. Rachel originally studied printed textiles at Chelsea School of art, before falling in love with machine embroidery. For the past 10 years she has worked from a small studio at her home in Dorset. She draws her inspiration from the countryside and people around her. She aims to create pieces that are bright fun and colourful that will leave you with a smile on your face. You can view more of her work on her facebook page Rachel Hewitt Machine Embroidery. A requirements list will be available on booking this class in the shop.